A retro racing game, in which we take part in crazy struggles on a variety of tracks. Super Pixel Racers allows you to play alone as well as multiplayer competition over the Internet or in split screen mode. 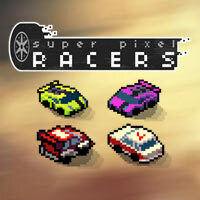 Super Pixel Racers is a retro style racing game. The production was developed by an independent studio H2 Interactive, while its release was taken care of by pQube. In Super Pixel Racers we participate in dynamic races on thirteen different tracks (from the sun-burnt desert to the narrow streets of the city) with varying weather conditions. Watching the struggle from a camera located high above the track, we drive various vehicles (the list includes both small but agile hot-hatches, as well as supercars). In order to cross the finish line in the first place, we have to drift through the corners. In this way we charge our supply of nitrous oxide, the skilful use of which may change the fate of many battles for the top placeon the podium. As we move forward, we unlock not only new machines, but also various upgrades. Super Pixel Racers allows you to play on your own (in the career mode) and to play multiplayer games over the Internet (accompanied by up to seven players) or on a split screen (with up to three people). Super Pixel Racers features 2D pixel art graphics. During the game, we are accompanied by a a dynamic chiptune soundtrack.